I've been a regular at T.J. Maxx for years now. There are two locations in my town and it's a good idea to hit them often since stock changes so quickly. But just because the bargains fly fast and furious doesn't mean you won't find good stuff on a regular basis. I love finding brand name stuff at almost absurd discounts, it makes me feel frugal even when I'm going overboard…thankfully, T.J. Maxx merchandise runs the gamut from clothing for all ages to home decor, bath and beauty products, luxury jewelry and accessories, kitchenware, toys and books, even gourmet pantry items! Unlike other discount retailers, most of the items are simply overstocked and are on-trend and in-season. Lucky me! I was given $50 to spend at T.J. Maxx and it wasn't hard to find things I wanted. I saw a Tokidoki laptop case, DKNY and Calvin Klein clothing for the kids, hiking socks for Bob, shoes galore. 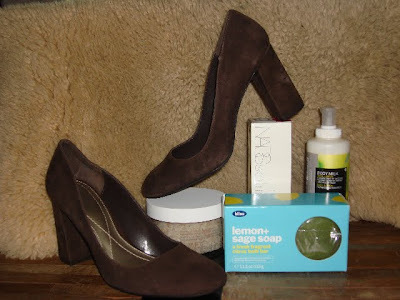 In the end, I went the selfish route and decided to buy luxury bath products and a pair of classic pumps. I was so thrilled to splurge- fancy body lotions and soap are not usually part of my budget. I highly recommend perusing the wares at T.J. Maxx (or their sister store, Marshall's, which apparently has an even more extensive shoe collection. Squee!) often. Are you up for some shopping this Labor Day weekend? I like your heels! We have a T.J. Maxx nearby but I rarely visit. I guess I should! Love the shoes! 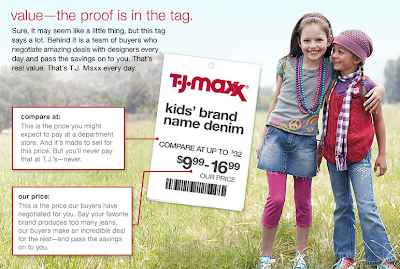 I've never been to a T.J. Maxx... don't have one in the area. I'll have to check them out next time we are in the city. I love TJ Maxx! You and I would be the best shopping buds if we lived in the same town. I've been dying to go shopping recently; especially since I work for a clothing company now. Nice, Naomi! Love the pumps. TJ Maxx and Marshalls are my favorite stores. I don't get there often enough (since technically our budget doesn't allow for much shopping anymore), but it's one of the few places I go for holiday shopping.